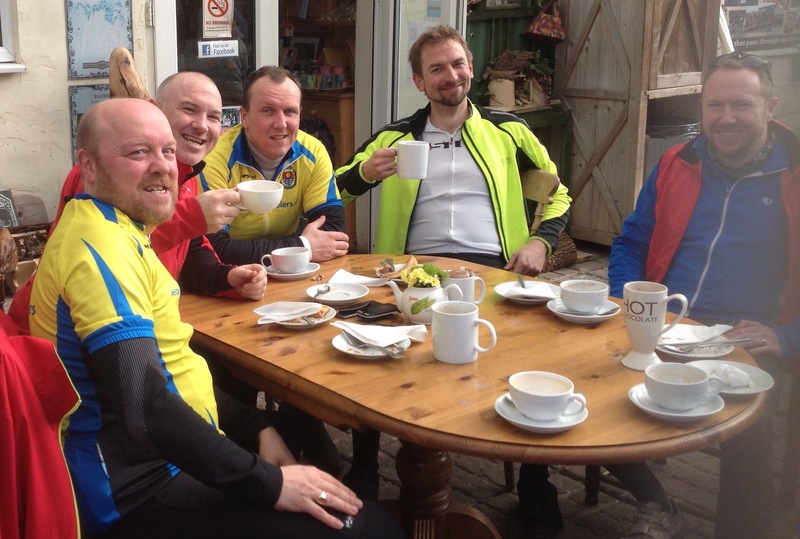 Club ride to Westhay : 28th February 2016. A bright, chilly, but frost free, morning greeted the Weston Wheelers as they assembled on Sunday morning. A group of ten riders headed out through St Georges, passing through Bourton and West Hewish before picking up A370 for a short stretch before turning back towards Banwell. Climbing up the hill past Banwell Caves and club made their way, via Loxton and Christon, to Cross and onto the A38 for a short stretch, picking up a rider from another club who was heading in the same direction, and taking the turn towards Wedmore. If they weren't warmed-up by the time they approached Wedmore, the riders certainly were shortly after, as the club made their way up and over Mudgley Hill. By now, John had dispelled the myth that Time Trialists can't climb hills for a second week running, leaving his compatriots in his wake. A fast descent in weak February sunshine, heralded the approach to Westhay and a short break at Sweets Cafe. Refuelled and rehydrated, the club turned for home, now cycling into the wind, as they traversed the Somerset Levels, passing through Burtle and River Bridge and onto the last significant leg-tester of Brent Knoll. After Lympsham came one of the club's favoured sprint sections, where the riders leant into the wind to take the honours of the One Mile Straight segment. Returning to Weston-super-mare, the club remained in convoy as they approached the Sea Front. At this point the various members peeled off and made their way home, having enjoyed the near perfect cycling weather for most of their ride. Today's ride was posted as 46 miles (75 km) with 2000ft (600m) of climbing. The group maintained an average speed of close to 16MPH (25.5kph). The Wheelers taking part in today's ride were; Patrick, Andy B, John, Aron, Pete G, Alan, Ben, Jason, and Duncan R. First time rider Duncan M was made welcome on the ride. Weston Wheelers membership is currently open and they are happy for non-club members to ride with them to see if group riding is something that they would like.